Letter to the editor, Stirling Observer. "Dear Editor – I have lived in Stirling for nearly seven years and love everything about the area – the friendly people, food, wonderful landscape, etc – but as a Buddhist, originally from Sri Lanka, I am upset and angry that statues which are very similar to the ones in temples across Sri Lanka are being used in bars and clubs, mostly in Glasgow but one has now opened up in Stirling. 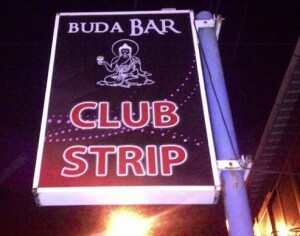 I wonder how people would react if someone tried to open a Jesus Bar, Virgin Mary Club, Hindu or Islam Bar. I am sure there would be a public outcry. The bar in question has statues behind the bar, next to bottles of spirits, etc, and also one next to a gaming machine. Religious statues, images and any other material relating to various religions are sacred to each faith. The use of Buddha statues for unholy purposes, mainly by non-Buddhist business people, might mislead many people (especially people from other religions) to think that Buddhism is associated with alcoholic beverages, gambling and disco music. Why has Stirling Council’s licensing board allowed this to go ahead? Schools in Stirling promote respect for other faiths to children and young people. Surely the local business community should lead by example. It is wrong for religious symbols to be used for commercial purposes. I am sure other Buddhists locally and in other parts of Scotland, also people from other religious backgrounds, find this practice in very bad taste."